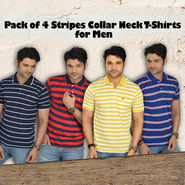 Matching to the older times, men t-shirts have become one of the most stylish and comfortable attire today. What men look for in perfect clothing? 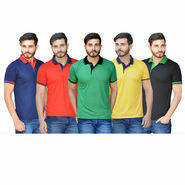 Of course, style and comfort, Naaptol understands these needs and therefore presents a huge collection of sophisticated t-shirt for men that effortlessly fulfill their needs. These T-shirts are available in a multitude of striking colors, sizes, design and materials with trendy prints and interesting slogans. You can wear them for casual outings or for semi-formal affairs. They will simply make you stand out of the clutter. 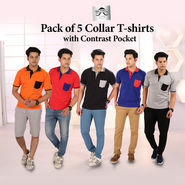 To get that perfect, eye-catching casual look you can team these trendy t-shirts with right fitting jeans and casual shoes. You can also put on matching accessories along with that if you want. 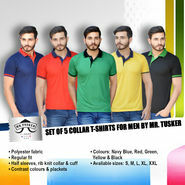 You can go for online shopping for these cool casual T-shirts which will save you from visiting multiple apparel shops. 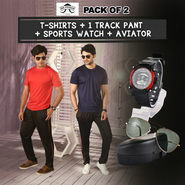 Naaptol.com is one of the best online shopping sites that offer you the freedom of selecting from its wide range of collection. 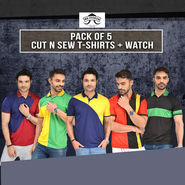 You will feel overwhelmed by seeing the number of fashion brands and their exclusive collection in our site and will have a great shopping experience while buying a number of branded men t-shirt from us. You will find different styles of T-shirts, from V-necks to round, collars to sleeves. 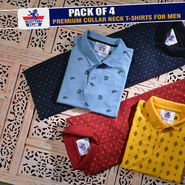 These are surely a must-have collection in every man's wardrobe. You just need to make the right choice as per your taste and fashion sense and there you are all ready for the day out or social gatherings. 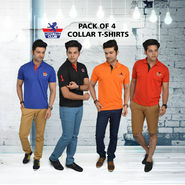 These are undoubtedly designer Tees that will enhance your masculine look making you look smart and elegant.